Nickel-plated loads from Fiocchi were developed and tested in the heart of South Dakota's pheasant country for the utmost in field performance. Fiocchi Golden Pheasant shells have long set the standard for quality and performance. Pride, Passion and a commitment to excellence has led to the development of these fine shotshells, providing hunters with confidence through proven performance and reliability. When you take the field with your family, friends, and dog make sure you are giving them the proven performer they deserve in Fiocchi of America’s Golden Pheasant. 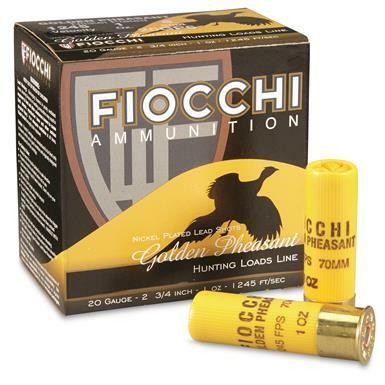 Fiocchi, Golden Pheasant, 20 Gauge, 2 3/4 Shells, 1 oz., Nickel Plated, 25 Rounds is rated 4.9 out of 5 by 11. Rated 5 out of 5 by Roy512 from Great Price and great results These shotshells were very effective in bringing down flushing pheasants. More so than ammo used by other hunters. My son and I used these and had consistently more knock downs that the guide asked what we were using. Rated 5 out of 5 by Brassill from Great Service from Sportsman's Guide Great price- fantastic 20 gauge Chukar loads. Shot my first triple with them on Sunday 12/4! Rated 5 out of 5 by Old Grouse Hunter from Excellent performance I shoot nearly ten boxes of Golden Pheasant size 7 1-2 in the grouse and woodcock covers of my state every fall and have found them to be my favorite by a large margin. We owe it to the birds we love to use only the best and injure and lose them with cheap, less effective shells. Rated 5 out of 5 by BMO1 from Great Ammo Fast shooting and hard hitting ammo. I have been using them exclusively for a couple of years now. Rated 5 out of 5 by Kelley from Fiocchi Golden Pheasant 20 Gauge 2 3/4" 1 oz. Shells Ships quick and packed well. Fires every time at the range. Rated 5 out of 5 by Bill from Best grouse load These are well made and well balanced. The best grouse load there is in my opinion. Rated 5 out of 5 by norman49 from great ammo completely satisfied!